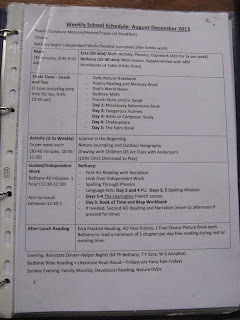 Here is part three of my Ambleside Planning Process, what our daily schedule/routine looks like. Originally, I had intended to write about my weekly planning first, and then my daily planning, but actually I find it makes more sense to share our daily plan/schedule first. Our daily plan is basically a block-type schedule, although it functions more as a flow chart for a routine than a true schedule. I do pencil times in when I am planning, but that’s mostly to be sure my time estimates are reasonable (in other words to reassure myself that, yes, on a ‘normal’ day we can get through all of this by lunch!). I don’t hold myself to time very tightly though. We do one thing, and then the next, and then the next. One of the keys to CM scheduling is the principle of alternation – changing up the type of work you are doing regularly to keep from getting bogged down and help keep focus and attention sharp. Each block in our schedule is sort of different, and I try to alternate between various types of work within each block too. Block One: Michelle works through her independent checklist while I finish up my chores and helping little ones with chores and do 20 minutes or so of preschool/Kindergarten type work with them. Block Two: Michelle and I sit down at the table. I look over her independent work and hear her narrations from reading she has done independently. If we are on a new Math U See lesson, I work through that with her (this is only once a week or so). On the other days we do about 10 minutes of math drill and about 10 minutes of math enrichment. Block Three: Morning Tea Time. This is our snack and whole-group/circle time. I posted about what our tea time looks like here, so I won’t repeat at that. Et voila! 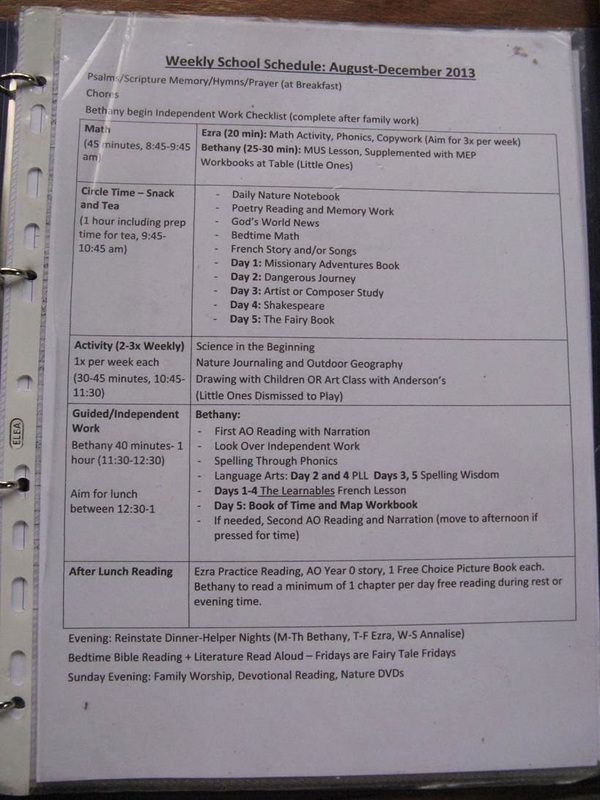 Because of the work I have put into the checklists at the start of the term, it is easy for me to check and see what I need to plug in to each spot on our daily schedule as we go along. (“Oh, what’s next? An Ambleside reading. Let’s look at this week’s reading list and choose one.”) This has worked out to be a good compromise between structure and flexibility for me. I can easily swap blocks around (or even skip a block if necessary) to go with life’s ebb and flow. And I don’t necessarily assign specific activities or readings to specific days – we can see how things are going each week and adjust accordingly. Next time, I’ll share with you what I do at the start of each week to help keep us on track. I second that Prince!! This is EXACTLY what I have been looking/hoping for. I am in the middle of my first year on this journey and have been having to plan week by week as we go...UGH!! (for various reasons) I tend to be OCD on the planning/prep part and this year is killing me! LOL Chalk it up to transition year!! But I have been on top of preparing for nest year and KNOW what I want to do...just didnt know how to put it together, especially with the things I want to change in other curriculum schedules. THIS IS IT!! Thank you so much for breaking it down so well for the year AND the terms!!! I cant wait to read your posts on week by week. Thanks again! Christmas Break Links for You!